Soundworks Collection recorded a panel discussion from the Game Developers Conference 2010 on how things were in the early days of game audio. 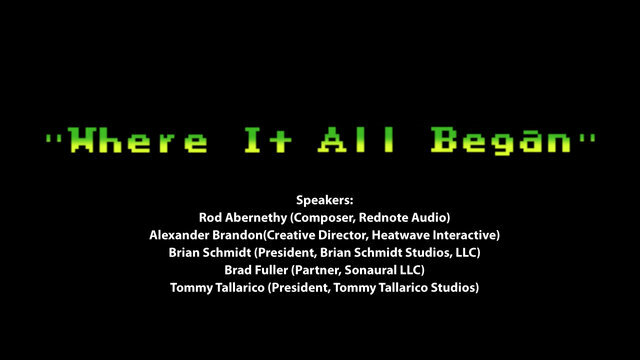 Not just a walk down memory lane, this panel will explore how the music of first generation 8-bit games was created and what makes it so well loved by gamers of all ages. What makes those old 8-bit tunes still so endearing, instantly recognizable and still fun to listen to? We will explore the glory days of game music, how it was created under unbelievable technical restrictions compared to today’s production standards. We’ll also explore how the modern day composer and audio director can use many of the same concepts and techniques used in first generation in today’s music. Watch Soundworks Collection’s full feature on the GDC sound talks here.